What is another word for Ourselves? ; sing. 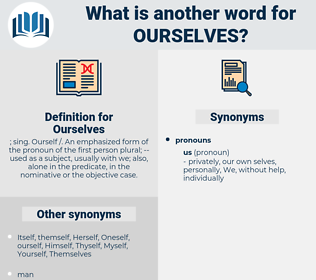 Ourself /. 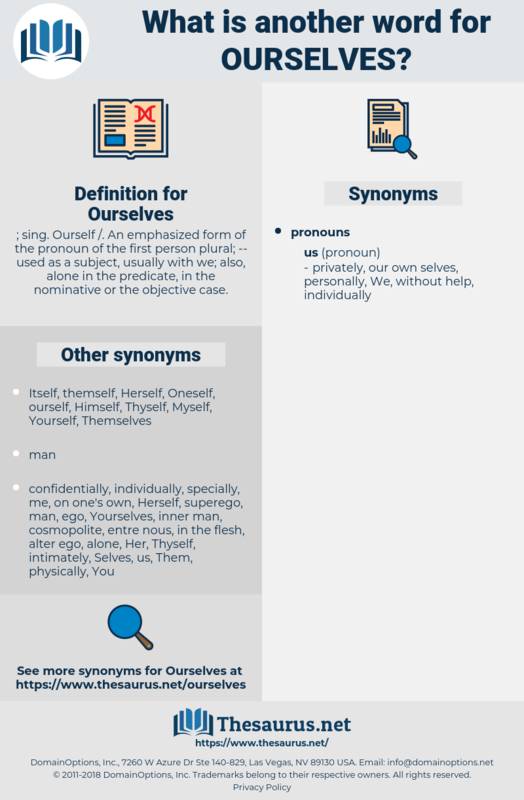 An emphasized form of the pronoun of the first person plural; -- used as a subject, usually with we; also, alone in the predicate, in the nominative or the objective case. minds, Yourselves, Respondents, Ones, sides. Were, felt, Hoped, Looked, Managed, admitted, Remained, wanted, tried, Myself. concerned, left, engaged, Told, focused, Looked, faced, Tackled, painted, sought, guided, Dealt, tried, Got. We'll keep our happiness to ourselves, won't we? But we must not remain here, thinking only of ourselves, when there is so much to be done.